For other uses, see Sinkhole (disambiguation). "Doline" redirects here. For other meanings, see Doline (disambiguation). Suffosion is one of the two geological processes by which subsidence sinkholes or dolines are formed, the other being due to collapse of an underlying cave or void, with most sinkholes formed by the suffosion process. Suffosion sinkholes are normally associated with karst topography although they may form in other types of rock including chalk, gypsum and basalt. In the karst of the UK's Yorkshire Dales, numerous surface depressions known locally as "shakeholes" are the result of glacial till washing into fissures in the underlying limestone. Sinkholes near the Dead Sea, formed when underground salt is dissolved by freshwater intrusion, due to continuing sea-level drop. Collapse sinkhole in gypsum, near Madrid, central Spain. 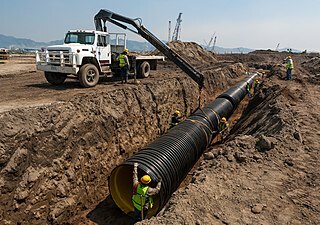 Drainage is the natural or artificial removal of a surface's water and sub-surface water from an area with excess of water. The internal drainage of most agricultural soils is good enough to prevent severe waterlogging, but many soils need artificial drainage to improve production or to manage water supplies. The formation of sinkholes involves natural processes of erosion  or gradual removal of slightly soluble bedrock (such as limestone) by percolating water, the collapse of a cave roof, or a lowering of the water table. Sinkholes often form through the process of suffosion. For example, groundwater may dissolve the carbonate cement holding the sandstone particles together and then carry away the lax particles, gradually forming a void. In earth science, erosion is the action of surface processes that removes soil, rock, or dissolved material from one location on the Earth's crust, and then transports it to another location. This natural process is caused by the dynamic activity of erosive agents, that is, water, ice (glaciers), snow, air (wind), plants, animals, and humans. In accordance with these agents, erosion is sometimes divided into water erosion, glacial erosion, snow erosion, wind (aeolic) erosion, zoogenic erosion, and anthropogenic erosion. The particulate breakdown of rock or soil into clastic sediment is referred to as physical or mechanical erosion; this contrasts with chemical erosion, where soil or rock material is removed from an area by its dissolving into a solvent, followed by the flow away of that solution. Eroded sediment or solutes may be transported just a few millimetres, or for thousands of kilometres. In physics, chemistry and materials science, percolation refers to the movement and filtering of fluids through porous materials. Occasionally a sinkhole may exhibit a visible opening into a cave below. In the case of exceptionally large sinkholes, such as the Minyé sinkhole in Papua New Guinea or Cedar Sink at Mammoth Cave National Park in Kentucky, an underground stream or river may be visible across its bottom flowing from one side to the other. Cedar Sink is a vertical-walled large depression, or sinkhole, in the ground, that is located in Edmonson County, Kentucky and contained within and managed by Mammoth Cave National Park. The sinkhole measures 300 feet (91.4 m) from the top sandstone plateau to the bottom of the sink and was caused by collapse of the surface soil. The landscape is karst topography, which means the region is influenced by the dissolution of soluble rocks. Sinkholes, caves, and dolines typically characterize these underground drainage systems. Cedar Sink has a bottom area of about 7 acres (2.8 ha) and has more fertile soil compared to the ridgetops. Sinkholes are common where the rock below the land surface is limestone or other carbonate rock, salt beds, or in other soluble rocks, such as gypsum,  that can be dissolved naturally by circulating ground water. Sinkholes also occur in sandstone and quartzite terrains. Halite, commonly known as rock salt, is a type of salt, the mineral (natural) form of sodium chloride (NaCl). Halite forms isometric crystals. The mineral is typically colorless or white, but may also be light blue, dark blue, purple, pink, red, orange, yellow or gray depending on the amount and type of impurities. It commonly occurs with other evaporite deposit minerals such as several of the sulfates, halides, and borates. The name halite is derived from the Ancient Greek word for salt, ἅλς (háls). Collapse formed by rainwater leaking through pavement and carrying soil into a ruptured sewer pipe. Collapses, commonly incorrectly labeled as sinkholes also occur due to human activity, such as the collapse of abandoned mines and salt cavern storage in salt domes in places like Louisiana, Mississippi and Texas. More commonly, collapses occur in urban areas due to water main breaks or sewer collapses when old pipes give way. They can also occur from the overpumping and extraction of groundwater and subsurface fluids. Sinkholes can also form when natural water-drainage patterns are changed and new water-diversion systems are developed. Some sinkholes form when the land surface is changed, such as when industrial and runoff-storage ponds are created; the substantial weight of the new material can trigger a collapse of the roof of an existing void or cavity in the subsurface, resulting in development of a sinkhole. Some sinkholes form in thick layers of homogenous limestone. Their formation is facilitated by high groundwater flow, often caused by high rainfall; such rainfall causes formation of the giant sinkholes in the Nakanaï Mountains, on the New Britain island in Papua New Guinea. On the contact of limestone and insoluble rock below it, powerful underground rivers may form, creating large underground voids. Blue holes – This name was initially given to the deep underwater sinkholes of the Bahamas but is often used for any deep water-filled pits formed in carbonate rocks. The name originates from the deep blue color of water in these sinkholes, which is created by the high clarity of the water and the great depth of the sinkholes; only the deep blue color of the visible spectrum can penetrate such depth and return after reflection. Cenotes – This refers to the characteristic water-filled sinkholes in the Yucatán Peninsula, Belize and some other regions. Many cenotes have formed in limestone deposited in shallow seas created by the Chicxulub meteorite's impact. Sótanos – This name is given to several giant pits in several states of Mexico. Lake Kashiba – Zambia. About 3.5 hectares (8.6 acres) in area and about 100 m (330 ft) deep. Akhayat sinkhole is in Mersin Province, Turkey. Its dimensions are about 150 m (490 f) in diameter with a maximum depth of 70 m (230 ft). Dean's Blue Hole – Bahamas. The second deepest known sinkhole under the sea, depth 203 m (666 ft). Popular location for world championships of free diving, as well as recreational diving. Great Blue Hole – Belize. Spectacular, round sinkhole, 124 m (407 ft) deep. Unusual features are tilted stalactites in great depth, which mark the former orientation of limestone layers when this sinkhole was above sea level. Hranice Abyss, Moravia, Czech Republic, is the deepest known underwater cave in the world, the lowest confirmed depth (as of 27 September 2016) is 473 m (404 m below the water level). Red Lake – Croatia. Approximately 530 m (1,740 ft) deep pit with nearly vertical walls, contains an approximately 280–290 m (920–950 ft) deep lake. Vouliagmeni – Greece. The sinkhole of Vouliagmeni is known as "The Devil Well",[ citation needed ] because it is considered extremely dangerous. Four scuba divers are known to have died in it. Maximum depth of 35.2 m (115 ft) and horizontal penetration of 150 m (490 ft). Water End Swallow Holes in Hertfordshire, England. Cave of Swallows – San Luis Potosí. 372 m (1,220 ft) deep, round sinkhole with overhanging walls. Sima de las Cotorras – Chiapas. 160 m (520 ft) across, 140 m (460 ft) deep, with thousands of green parakeets and ancient rock paintings. Sótano de la Lucha – Chiapas. Bigger than Sima de las Cotorras and with lush vegetation on the floor. It can be reached through a cave. Sótano del Barro – Querétaro. 410 m (1,350 ft) deep, with nearly vertical walls. 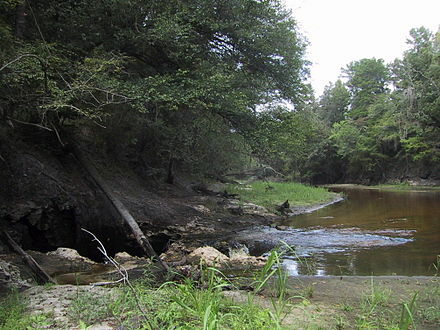 Bayou Corne sinkhole – Assumption Parish, Louisiana. About 25 acres in area  and 750 ft (230 m) deep. The Blue Hole – Santa Rosa, New Mexico. The surface entrance is only 80 feet (24 m) in diameter, it expands to a diameter of 130 feet (40 m) at the bottom. Grassy Cove – Tennessee. 13.6 km2 (5.3 sq mi) in area and 42.7 m (140 ft) deep,  a National Natural Landmark. Kingsley Lake – Florida. 8.1 km2 (2,000 acres) in area, 27 m (89 ft) deep and almost perfectly round. Harwood Hole – Abel Tasman National Park, New Zealand, 183 m (600 ft) deep. 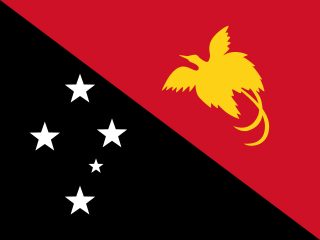 Minyé sinkhole – East New Britain, Papua New Guinea. 510 m (1,670 ft) deep, with vertical walls, crossed by a powerful stream. Sima Humboldt – Venezuela. Largest sinkhole in sandstone, 314 m (1,030 ft) deep, with vertical walls. Unique, isolated forest on bottom. In the western part of Cerro Duida, Venezuela, there is a complex of canyons with sinkholes. Deepest sinkhole is 450 m (1,480 ft) deep (from lowest rim within canyon); total depth 950 m (3,120 ft). 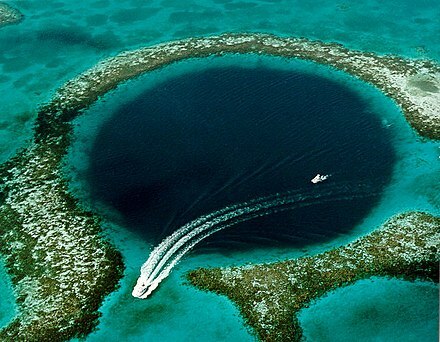 A blue hole is a large marine cavern or sinkhole, which is open to the surface and has developed in a bank or island composed of a carbonate bedrock. Blue holes typically contain tidally influenced water of fresh, marine, or mixed chemistry. They extend below sea level for most of their depth and may provide access to submerged cave passages. Well-known examples can be found in South China Sea, Belize, the Bahamas, Guam, Australia, and Egypt. Dos Ojos is part of a flooded cave system located north of Tulum, on the Caribbean coast of the Yucatán Peninsula, in the state of Quintana Roo, Mexico. The exploration of Dos Ojos began in 1987 and still continues. The surveyed extent of the cave system is 82 kilometers (51 mi) and there are 28 known sinkhole entrances, which are locally called cenotes. In January 2018, a connection was found between Sistema Dos Ojos and Sistema Sac Actun. The smaller Dos Ojos became a part of Sac Actun, making the Sistema Sac Actun the longest known underwater cave system in the world. A pit cave, shaft cave or vertical cave—or often simply called a pit or pot ; jama in South Slavic languages scientific and colloquial vocabulary —is a type of cave which contains one or more significant vertical shafts rather than being predominantly a conventional horizontal cave passage. Pit caves typically form in limestone as a result of long-term erosion by water. They can be open to the surface or found deep within horizontal caves. Among cavers, a pit is a vertical drop of any depth that cannot be negotiated safely without the use of ropes or ladders. The Deep Phreatic Thermal Explorer (DEPTHX) is an autonomous underwater vehicle designed and built by Stone Aerospace, an aerospace engineering firm based in Austin, Texas. It was designed to autonomously explore and map underwater sinkholes in northern Mexico, as well as collect water and wall core samples. The DEPTHX vehicle was the first of three vehicles to be built by Stone Aerospace which were funded by NASA with the goal of developing technology that can explore the oceans of Jupiter's moon Europa to look for extraterrestrial life. Zacatón is a thermal water-filled sinkhole belonging to the Zacatón system - a group of unusual karst features located in Aldama Municipality near the Sierra de Tamaulipas in the northeastern state of Tamaulipas, Mexico. It is the deepest known water-filled sinkhole in the world with a total depth of 339 metres (1,112 ft): the 392 metres (1,286 ft) plus deep Pozzo del Merro is deeper, but its nature as a near-vertical cave or a sinkhole still being debated. The Cave of Swallows, also called the Cave of the Swallows, is an open air pit cave in the Municipality of Aquismón, San Luis Potosí, Mexico. The elliptical mouth, on a slope of karst, is 49 by 62 m wide and is undercut around all of its perimeter, widening to a room approximately 303 by 135 meters wide. The floor of the cave is a 333-meter (1092 ft) freefall drop from the lowest side of the opening, with a 370-meter (1,214 ft) drop from the highest side, making it the largest known cave shaft in the world, the second deepest pit in Mexico and perhaps the 11th deepest in the world. The Caves of the Tullybrack and Belmore hills can be found in south-west County Fermanagh, Northern Ireland. The region is also described as the West Fermanagh Scarplands by environmental agencies and shares many similar karst features with the nearby Marble Arch Caves Global Geopark. An abîme is the geographical term for a vertical shaft in karst terrain that may be very deep and usually opens into a network of subterranean passages. The Hranice Abyss, the English name adopted by the local tourist authorities, is the deepest flooded pit cave in the world. It is a karst sinkhole located near the town of Hranice. The greatest confirmed depth is 473 m, which makes it the deepest known underwater cave in the world. Moreover, the expected depth is 800–1200 m.
The Xiaozhai Tiankeng (小寨天坑), also known as the Heavenly Pit, is the world's deepest sinkhole. It is located in Fengjie County of Chongqing Municipality. Er Wang Dong is a large cave in the Wulong Karst region, in Wulong County of Chongqing Municipality of China. Little Blue Lake is a water-filled doline in the Australian state of South Australia located in the state's south-east in the locality of Mount Schank about 20 kilometres (12 mi) south of the municipal seat of Mount Gambier. It is notable locally as a swimming hole and nationally as a cave diving site. It is managed by the District Council of Grant and has been developed as a recreational and tourism venue. Pozzo del Merro is a flooded sinkhole in the countryside northeast of Rome, Italy. Situated at the bottom of an 80 m conical pit, at 392 m (1,286 ft) it is the second deepest underwater vertical cave in the world. In 2000 two ROVs were sent to explore its depths; the first, the "Mercurio (Mercury)" reached its maximum operative depth of 210 m (690 ft) without reaching the bottom. The second ROV, "Hyball 300", reached 310 m (1,020 ft) without touching down either. A third dive in 2002 with the more advanced "Prometeo" robot reached the bottom at 392 m (1,286 ft), but discovered a narrow passage continuing horizontally. ↑ Whittow, John (1984). Dictionary of Physical Geography. London: Penguin. p. 488. ISBN 978-0-14-051094-2. ↑ Thomas, David; Goudie, Andrew, eds. (2009). The Dictionary of Physical Geography (3rd ed.). Chichester: John Wiley & Sons. p. 440. ISBN 978-1444313161. ↑ Kohl, Martin (2001). "Subsidence and sinkholes in East Tennessee. A field guide to holes in the ground" (PDF). State of Tennessee. Retrieved 18 February 2014. ↑ "Caves and karst – dolines and sinkholes". British Geological Survey. ↑ Kohl, Martin (2001). "Subsidence and sinkholes in East Tennessee. A field guide to holes in the ground" (PDF). State of Tennessee. Archived from the original (PDF) on 12 October 2013. Retrieved 18 February 2014. ↑ Breining, Greg (5 October 2007). "Getting Down and Dirty in an Underground River in Puerto Rico". The New York Times. ISSN 0362-4331 . Retrieved 31 March 2016. ↑ Palmer, Arthur N. (1 January 1991). "Origin and morphology of limestone caves". Geological Society of America Bulletin. 103 (1): 1–21. doi:10.1130/0016-7606(1991)1032.3.CO;2 (inactive 2019-03-16). ISSN 0016-7606. ↑ Friend, Sandra (2002). Sinkholes. Pineapple Press Inc. p. 11. ISBN 978-1-56164-258-8 . Retrieved 7 June 2010. ↑ Tills 2013, p. 181. ↑ "Quarrying and the environment". bgs. bgs. Retrieved 3 June 2018. ↑ "Sinkholes in Washington County". Utah gov Geological Survey. Archived from the original on 23 March 2011. 1 2 Tills 2013, p. 182. ↑ Vincent, Jean-Baptiste; et al. (2 July 2015). "Large heterogeneities in comet 67P as revealed by active pits from sinkhole collapse". Nature. 523 (7558): 63–66. Bibcode:2015Natur.523...63V. doi:10.1038/nature14564. PMID 26135448 . Retrieved 2 July 2015. ↑ Ritter, Malcolm (1 July 2015). "It's the pits: Comet appears to have sinkholes, study says". AP News . Retrieved 2 July 2015. ↑ "What is a sinkhole?". CNC3. Retrieved 31 March 2016. 1 2 3 4 "Largest and most impressive sinkholes of the world". Wondermondo. ↑ Zhu, Xuewen; Chen, Weihai (2006). "Tiankengs in the karst of China" (PDF). Speliogensis and Evolution of Karst Aquifers. 4: 1–18. ISSN 1814-294X. ↑ "Sistema Zacatón". by Marcus Gary. 1 2 "Sistema Zacatón". Wondermondo. ↑ Vazquez, Tyler (September 29, 2017). "The Hole Truth". Florida Today. Melbourne, Florida. pp. 1A, 2A. Retrieved September 29, 2017. ↑ William L. Wilson; K. Michael Garman. "IDENTIFICATION AND DELINEATION OF SINKHOLE COLLAPSE HAZARDS IN FLORIDA USING GROUND PENETRATING RADAR AND ELECTRICAL RESISTIVITY IMAGING" (PDF). Subsurface Evaluations, Inc. Case 3 – Mariner Boulevard. ↑ Rock, Tim (2007). Diving & Snorkeling Belize (4th ed.). Footscray, Vic. : Lonely Planet. p. 65. ISBN 9781740595315. ↑ "Black Hole of Andros". Wondermondo. ↑ Waltham, Tony; Bell, Fred; Culshaw, Martin (2005). Sinkholes and subsidence: karst and cavernous rocks in engineering and construction (1st ed.). Berlin [u.a. ]: Springer [u.a.] p. 64. ISBN 978-3540207252. ↑ "Subsidence". Waikato Regional Council. Retrieved 2018-01-25. ↑ Tills 2013, p. 184. ↑ Fletcher, Dan (1 June 2010). "Massive Sinkhole Opens in Guatemala". Time.com. Retrieved 20 March 2013. ↑ Vidal, Luis; Jorge Nunez (2 June 2010). "¿Que diablos provoco este escalofriante hoyo?". Las Ultimas Noticias (in Spanish). Retrieved 20 March 2013. ↑ Than, Ker (1 June 2010). "Sinkhole in Guatemala: Giant Could Get Even Bigger". National Geographic. Retrieved 20 March 2013. 1 2 3 Waltham, T. (2008). "Sinkhole hazard case histories in karst terrains". Quarterly Journal of Engineering Geology and Hydrogeology. 41 (3): 291–300. doi:10.1144/1470-9236/07-211. ↑ Halliday, W.R. (2007). "Pseudokarst in the 21st Century" (PDF). Journal of Cave and Karst Studies. 69 (1): 103–113. Retrieved 24 March 2013. ↑ Halls, Monty; Krestovnikoff, Miranda (2006). Scuba diving (1st American ed.). New York: DK Pub. p. 267. ISBN 9780756619497. ↑ Beaumont, P.B. ; Vogel, J.C. (May–June 2006). "On a timescale for the past million years of human history in central South Africa". South African Journal of Science. 102: 217–228. hdl:10204/1944. ISSN 0038-2353. ↑ Rajendran, Sankaran; Nasir, Sobhi (2014). "ASTER mapping of limestone formations and study of caves, springs and depressions in parts of Sultanate of Oman". Environmental Earth Sciences. 71 (1): 133–146, figure 9d (page 142), page 144. doi:10.1007/s12665-013-2419-7. ↑ Zhu, Xuewen; et al. (2003). 广西乐业大石围天坑群发现探测定义与研究[Dashiwei Tiankeng Group, Leye, Guangxi: discoveries, exploration, definition and research]. Nanning, Guangxi, China: Guangxi Scientific and Technical Publishers. ISBN 978-7-80666-393-6. ↑ "China Exclusive: South China Sea "blue hole" declared world's deepest". New China. Xinhua. Archived from the original on 24 July 2016. ↑ "Researchers just discovered the world's deepest underwater sinkhole in the South China Sea". The Washington Post. ↑ "陕西发现天坑群地质遗迹并发现少见植物和飞猫" [Tiankeng group of geological relics with rare plants and flying cats found in Shaanxi]. Sohu.com Inc. Archived from the original on 25 November 2016. ↑ "时事新闻--解密汉中天坑群——改写地质历史的世界级"自然博物馆"" [Deciphering the Hanzhong tiankeng group — world-class "Nature Museum"]. Hanzhong People's Municipal Government. 25 November 2016. Archived from the original on 27 November 2016. ↑ "Dhofar caves: A tourist's paradise". Muscat Daily. 11 January 2015. Archived from the original on 27 November 2016. ↑ Zhu, Xuewen; Waltham, Tony (2006). "Tiankeng: definition and description" (PDF). Speleogenesis and Evolution of Karst Aquifers. 4 (1): 1–8, Fig. 4. Structural interpretation of Xiaozhai Tiankeng, page 4. ↑ Schonauer, Scott (21 July 2007). "Missing American divers will be laid to rest after 30 years". Stars and Stripes. Retrieved 28 April 2013. ↑ Wines, Michael (25 September 2013). "Ground Gives Way, and a Louisiana Town Struggles to Find Its Footing". New York Times. Retrieved 26 September 2013. ↑ Horswell, Cindy (5 January 2009). "Daisetta sinkhole still a mystery 8 months after it formed". Houston Chronicle. Retrieved 29 June 2013. ↑ Blumenthal, Ralph (9 May 2008). "Sinkhole and Town: Now You See It". The New York Times. Retrieved 29 June 2013. ↑ "Devils Millhopper Geological State Park". Floridastateparks.org. Retrieved 3 May 2014. ↑ Dunigan, Tom. "Grassy Cove". Tennessee Landforms. Retrieved 11 March 2014. ↑ "Cathedral Valley – Capitol Reef National Park". National Park Service, US Dept of Interior. Retrieved 24 March 2013. ↑ "Lake Peigneur: The Swirling Vortex of Doom". ↑ chondram (14 August 2012). "Mysterious Louisiana Sinkhole Drains Entire Lake" – via YouTube. ↑ Huber, Red (13 November 2012). "Looking back at Winter Park's famous sinkhole". Orlando Sentinel. Wikimedia Commons has media related to Sinkholes . Wikisource has the text of the 1911 Encyclopædia Britannica article Swallow-hole . James, Vincent (18 February 2014). "What are sinkholes, how do they form and why are we seeing so many?". The Independent.co.uk. Retrieved 19 February 2014.